Charles Trevelyan is one of the most vilified figures in Irish history but Varoufakis sees parallels in the ECB’s Jean-Claude Trichet. FORMER GREEK FINANCE minister Yanis Varoufakis says the ECB’s reaction to Ireland’s property crash was similar to that of the British government during the Great Famine. The 1845-1852 famine, partly caused by a potato blight, led to the death of around 1 million Irish people, and the emigration of at least another million. Varoufakis, who rose to prominence at the height of the Greek debt crisis due to his truculence in dealing with European partners, compared the EU’s treatment of Ireland to the Irish policies pursued by the imperial British governments of Sir Robert Peel and Lord John Russell over 160 years ago. Charles Trevelyan, who was in charge of the administration of government relief during the Famine, has gone down in history along with Oliver Cromwell as one of the great bogeymen of Irish history. Immortalised in The Fields of Athenry, Trevelyan limited the British Government’s food aid programme to its stricken colony because of a firm belief that God was teaching the Irish a lesson. Varoufakis sees modern parallels in the approach by Jean-Claude Trichet of the European Central Bank to the Irish banking crisis. When Irish voters rejected the Treaty of Lisbon in 2008, the EU forced them to vote again until they delivered the “right” outcome.A year later, when private Irish banks imploded, threatening their (mainly) German private creditors with severe losses, Jean-Claude Trichet, the European Central Bank’s then-president, immediately “informed” the Irish government that the ECB would shut down ATMs across the Emerald Isle unless Ireland’s unsuspecting taxpayers made the German banks whole. Varoufakis took a swipe at Ireland last year, when he said other indebted EU countries were “energetic enemies” of efforts to negotiate a better deal for Greece. Taoiseach Enda Kenny bluntly opposed the idea of debt relief for Athens when asked about the matter during crisis talks on 25 June last year. Yet Varoufakis says Ireland was also treated harshly, comparing the ECB’s response to our debt crisis to the the huge export of food from our shores while the population died of starvation and disease. The ECB, in an affront comparable to British behavior during the 1845-52 Potato Famine, instructed the government to invoke “financial stability” to force Ireland’s weakest citizens to repay every euro the defunct private banks owed to German creditors.Financial stability was obviously a smokescreen: taxpayers were forced to repay even the debts of a bank that had already been closed (and thus systemically irrelevant). 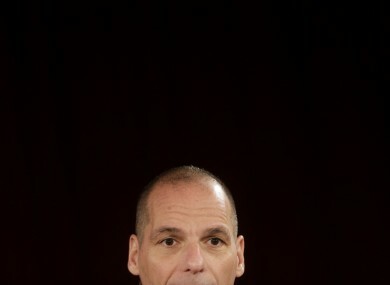 Email “Trichet's Corn: Yanis Varoufakis says the ECB are as bad as the British during the Famine”. Feedback on “Trichet's Corn: Yanis Varoufakis says the ECB are as bad as the British during the Famine”.